Allows the user to access a conversion dictionary. The dictionary consists of entries (pairs) of the form ( aLeftText, aRightText ). Those pairs can be added and removed. Also it can be looked for all entries where the left text or the right text matches a given text. Thus it can be used for conversions in both directions. Restrictions to what has to be the left and right text are usually given by specific services implementing this interface. is used to add a conversion pair to the dictionary. aLeftText the left text of the pair to be added. aRightText the right text of the pair to be added. com::sun::star::lang::IllegalArgumentException if the arguments are invalid. For example if the specifications defined by the service implementing this object are not met. com::sun::star::container::ElementExistException if such an entry already exists. removes all entries from the dictionary. a list of all left or right parts of the dictionaries entries. eDirection specifies if all left or all right parts of the entries should be returned. searches for entries or conversions that match the given text. The exact string to be looked for is the substring from the aText parameter that starts at position nStartPos and has the length nLength. the list of conversions found for the supplied text. If no nothing was found, it is empty. aText the text where the substring to be looked for will be taken from. Depending on the conversion direction parameter it specifies either the left text or the right text to look for. nStartPos the starting pos of the substring to be looked for. nLength the length of the substring to be looked for. eDirection specifies the direction of the conversion to look for. 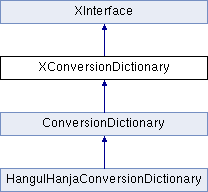 It is one of com::sun::star::linguistic2::ConversionDirection. nTextConversionOptions Combination of com::sun::star::i18n::TextConversionOption values. com::sun::star::lang::IllegalArgumentException if the locale is not supported by the dictionary or if nTextConversionOptions is invalid for the given locale. the conversion type supported by the dictionary. the language supported by the dictionary. returns the maximum number of characters used as left or right text in entries. eDirection specifies if the left text or the right text of entries will be used. the name of the dictionary. TRUE if the dictionary is active, FALSE otherwise. removes a conversion pair from the dictionary. aLeftText the left text of the pair to be removed. aRightText the right text of the pair to be removed. com::sun::star::container::NoSuchElementException if there is no such entry. specifies whether the dictionary should be used or not . bActivate TRUE if the dictionary should be used, FALSE otherwise.